Touchscreen and keypad panels with brilliant TFT/LED display colors and multi-protocol connectivity. 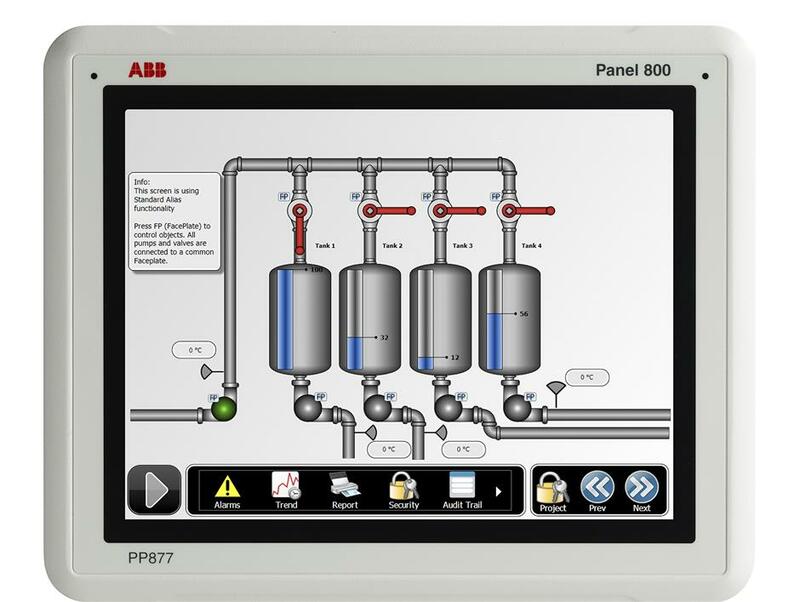 The standard range of Panel 800 comprises of PP871, PP874, PP877, PP874K and P877K that are easy-to use HMI with comprehensive and integrated templates and libraries for every conceivable process you need. All standard panels are equipped with high-resolution graphics in TFT/LED display. Besides the 4", 7" and 10" touchscreen panels, this range also includes 7" and 10" keypad panels with 16 and 22 function keys respectively. Most models offer wide screen, high resolution display for increased efficiency and excellent operator interaction. A fully deployable HMI with comprehensive and integrated templates and libraries for every conceivable process. The Panel Builder tool, with familiar Microsoft® Windows® environment along with multiple language support results in quick, easy and efficient engineering. Vector-based, high-resolution graphics in TFL/LED display, with icon-based interface, navigation and control. Panel 800 is constructed in a strong yet lightweight diecast, powder-coated aluminum housing. (IP66/IP20 for PP871), (IP65/IP20 for PP874, PP877, PP874K and PP877K) front casing withstands wet, dusty and demanding environments. Operating temperatures ranging between -10° C to + 60° C with maximum 85% humidity. Built on open architecture and technologies that accompany the .NET framework, these panels are capable of multi-brand controller connectivity. A multitude of connection options are available for local communication, expansion, remote access and more. Nice possibility to simulate and run the application directly from the Panel Builder 800 before you use it. Interaction type "Resistive touch, 1 million finger touch operations"